Ahhh... the holidays. Between shopping, wrapping, cooking, planning, organising, cleaning, shovelling, discovering that you've got a big hole in the toe of your boot only after you step into a puddle of slush... sometimes it begins to feels like there aren't enough hours in a day. Many people also tend to pack on the pounds at this time of year, going from one gathering to the next, stuffing their faces with greasy fried appetizers and pounding back the cocktails. If you're nodding your head at these statements, beware: the combination of stress and bad eating is sure to leave you feeling bloated, nauseated, and all-around sluggish. Stop! Breathe. Relax. Enter simplicity. Allow me to make your entertaining a little easier and a little healthier this year, with a few ideas for homemade, nutritious hors d'oeuvres that'll wow your guests, and please everyone - from the foodies to the health-conscious. 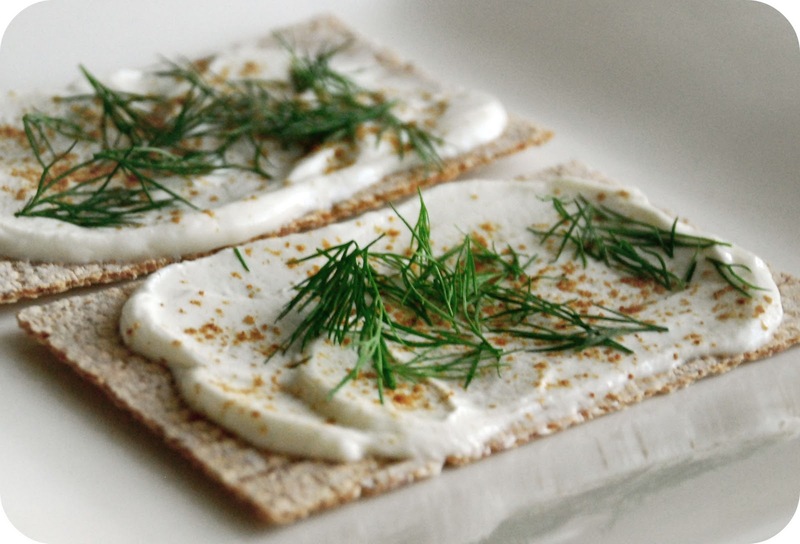 Instructions: Start with a box of Kavli Crispy Thin, FinnCrisp Rye Crisps (or any other crispbread that you like), top with spread of choice, and finish with a sprinkle of spice & a chopped herb. Pictured above: Dill, greek yogourt & cumin crisps. Super easy, super healthy, super fast. Ordinary store-bought crackers are often loaded with fats, oils and contain sodium levels that are off the charts. Don't even be fooled by the 'multi-grain' variety! Multi-grain often only means that they've taken your ordinary white-flour cracker and thrown in a few flax and sesame seeds - these additions do nothing to lower the high fat, salt or carb content, and the majority of the calories are coming from refined white flour. Now, I won't deny how delicious a Ritz cracker is, but that's the danger: at nearly 1g of fat EACH, a handful of these crackers contains the same amount of fat as an entire chocolate bar, and will fill you with over 200 calories - yet they will not leave you feeling full in the least. And then there's crispbread: these thin topable delights generally have just a few simple ingredients and contain nothing artificial. They're often made from rye flour, which is much easier to digest than wheat and significantly more nutritious. 6 Kavli crispy thins offer up 4g of dietry fibre (to keep you feeling fuller longer), contain zero grams of fat, and have only 100 calories all together. Top them with a spoonful of non-fat greek yogourt (loaded with protein), a sprinkle of cumin and some chopped fresh dill, and you've got yourself a pretty, easy, and nutritious hors d'oeuvre. These also make an excellent light lunch or dinner, or a healthy midnight snack.